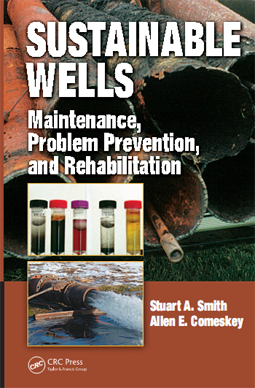 Sustainable Wells, by Stuart A. Smith and Allen E. Comeskey, is a handbook for working well managers and operators, providing a comprehensive, readable, and well-illustrated work with up-to-date information (largely free of product and vendor bias) to help the reader make good decisions to improve and maintain well performance. The text is technical but presented in an understandable manner without talking down to the nonspecialists. Rather than focusing on some certain aspect of well cleaning, or a particular technical approach, it covers the scope of maintenance and rehabilitation, from planning to evaluation testing. In particular, Sustainable Wells leans heavily on the need for preventive design, maintenance monitoring, and evaluation testing. The goal: prevent and slow well deterioration so that rehabilitation crises can be prevented. The book is based on the authors’ long hands-on experience serving a well-operating clientele and a world of connection with experts in the field. In addition to water supply wells, it addresses the problems and maintenance issues of monitoring, plume control, and other "environmental" wells. While focused on North American experiences, it is intended to be internationally useful.